Dogs, and sometimes cats, have long been used as support animals to help humans deal with a wide range of physical and psychiatric conditions, but ducks, not so much. That’s what makes Daniel Turducken Stinkbottom, the internet’s latest sweetheart, so darn special. Daniel made international headlines a couple of days ago, after photos of him accompanying his human on an airplane were posted on Twitter and quickly went viral. 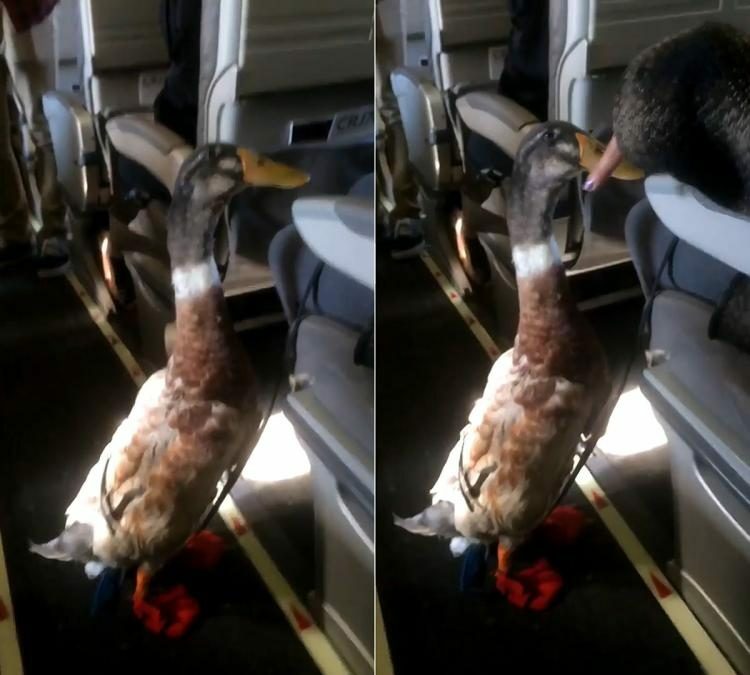 It’s not every day that you get to see a duck on an airplane, especially one that’s wearing adorable red shoes and a Captain America diaper. So it’s no surprise that he caught people’s eye – both those on the plane and millions others looking at his photos online. Mark Essig, the man’s whose photos of Daniel got the most attention, says that everyone on the plane was delighted to have a duck on board, and couldn’t stop snapping photos of him. And who could blame them, the little guys is simply too cute! But it turns out there is more to Daniel than a pretty little head and a funny set of accessories. He is a support animal for his owner, Carla Fitzgerald, who is recovering from post-traumatic stress disorder. Fitzgerald adopted Daniel in 2012, when he was two days old, as a pet, but being involved in a terrible accident just a year later, he became her support animal. She was a horse-and-carriage driver in Milwaukee, when a driver texting behind the wheel crashed into her carriage from behind, injuring the horse and throwing her a metal-grated drawbridge. Carla told reporters that she wouldn’t have been able to leave the house after the accident, it weren’t for Daniel. Since the ordeal, the adorable duck has accompanied her everywhere, mostly on car rides. This Monday marked his first airplane flight, and it was certainly one to remember. Fitzgerald had a letter from her doctor in which he states that it is in her best interest to have Daniel around as a support animal. She presented it to the flight crew so they’d allow the duck on board, and not only did they not object, but they also presented Mr. Turducken Stinkybottom with a “Certificate of First Flight”.